What Is the Daily Recommended Serving Size of Fruits & Vegetables? When you consume the recommended daily intake of fruits and vegetables, you get the variety of nutrients and phytochemicals needed to help lower your risk of heart disease, prevent cancer and other illnesses and maintain optimal health, reports the Harvard School of Public Health. You may find some sources, such as nutrition labels, that use different serving sizes, but the U.S. Department of Agriculture recommends daily servings of fruits and vegetables in terms of cups. The USDA recommends that adult men and women who consume 2,000 to 2,799 calories should get 2 cups of fruits daily. If you get fewer than 2,000 calories a day or you're a woman under the age of 31, you can lower your intake to 1.5 cups daily. People who eat more than 2,800 calories daily should increase their consumption to 2.5 cups. 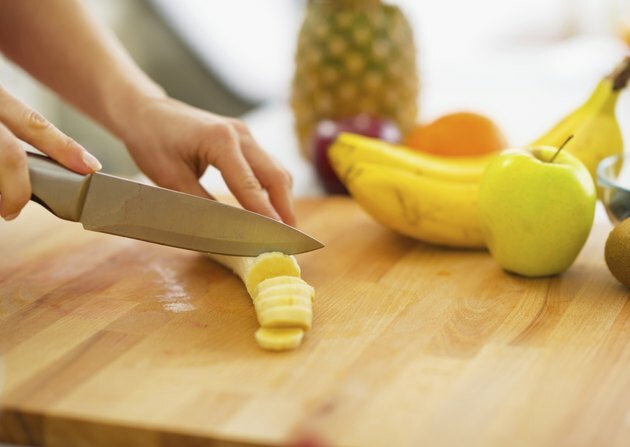 A 1-cup serving equals one measuring cup of 100 percent juice and sliced or chopped fruit, one small apple, or one large banana, orange or peach. Up until age 51, women should consume 2.5 cups of vegetables every day. Beyond 51, the recommendation drops to 2 cups, according to ChooseMyPlate.gov. Men should consume 3 cups daily and can lower their intake to 2.5 cups after the age of 51. You can also tailor your intake according to the calories you consume each day. If you get 1,600 to 2,199 calories, you should eat at least 1.5 cups of vegetables daily. Those who consume more than 2,200 calories daily should increase their intake to 2 cups, according to the publication "Dietary Guidelines for Americans, 2010." All the veggies in each color group are nutritionally similar, but combinations offer different levels of vitamins, minerals and phytochemicals. To help you get the full range of nutrients in your diet, "Dietary Guidelines for Americans, 2010" recommends a weekly intake for each color group, which is based on eating 2.5 cups daily. Try to get about 5 cups weekly from starchy vegetables and 5.5 cups from the red and orange group. Dark greens and beans should account for 1.5 cups each per week. Another 4 cups weekly should come from the group called "other vegetables," which includes bean sprouts, beets, cabbage, cauliflower, celery, cucumbers, green beans and onions. For most vegetables, a 1-cup serving equals one measuring cup. If you're going with raw leafy greens, you need 2 measuring cups of chopped raw veggies to get the equivalent of a 1-cup serving. Some sizes of whole foods that provide a 1-cup serving include two medium carrots, one medium white potato and one large sweet potato, sweet pepper or ear of corn. One large tomato and 1 cup of tomato juice also represent a 1-cup serving of vegetables. ChooseMyPlate.gov makes it easy to estimate the required servings without measuring: Just fill half of your plate with fruits and vegetables. USDA ChooseMyPlate.gov: What Foods Are in the Vegetable Group? What Are Health Benefits of Bell Peppers? How Many Ounces Are in a Serving of Vegetables?